Revo Elite RG-59 cable makes installations easier by carrying video and power over one cable. 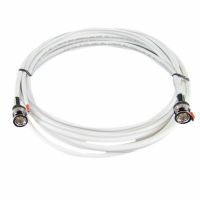 Cable comes complete with BNC ends that make connecting a BNC type camera to a BNC type DVR a snap. The contents include 300 ft of RG59 Siamese cable. Q:How do I connect the power at the camera and DVR when using these Siamese cables? If I have to purchase the power connectors separate , Can you provide me with a part number? Q:How do I connect power using the RG59 Siamese cable? Same question that Ben Hill asked. How do I connect the power at the camera and DVR when using these Siamese cables? If I have to purchase the power connectors separate , Can you provide me with a part number? How do I connect power using the RG59 Siamese cable? Same question that Ben Hill asked.